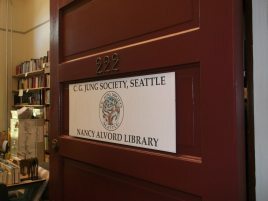 The Nancy Alvord Library, one of the most unique libraries in America, is housed at the Good Shepherd Center in the Wallingford neighborhood of Seattle. It contains more than 2,600 volumes on psychology, religion, philosophy, symbolism, and cultural anthropology. Central to this extensive library of works collected over the 40-year history of the Society is the Kate Millard Memorial Collection of rare and out-of-print works by Carl Jung and Jungian scholars, theorists, historians, and analysts. The public is welcome to visit our library to view available resources, and members have check-out privileges (for eligible* volumes) as a benefit of membership. Or search our library online. The Good Shepherd Center, owned and operated by Historic Seattle, sits adjacent to Meridian Playground, and can be accessed by bus and car. The building is wheelchair-accessible and has ample parking. The library is open Saturdays from 12:30 pm to 3:30 pm. The address is 4649 Sunnyside Ave. N., Rm. 222, Seattle WA 98103. Please contact us with any questions. In addition to print materials, our library houses audio and video cassettes and DVDs of lectures presented to the Society over its 40-year history. This collection features talks by hundreds of notable contributors to the field of Jungian psychology. All of these audio resources will soon be available for members to enjoy (and limited titles will be available to the public) under “Digital Media”. We welcome donations of books and audio-video resources for our library. We also welcome donations that can help subsidize our office expenses. Visit our office to see the wide variety of inexpensive used books for sale! * Eligible volumes: Some volumes in our library, including the Kate Millard Memorial Collection, are for reference only and may not be checked out.